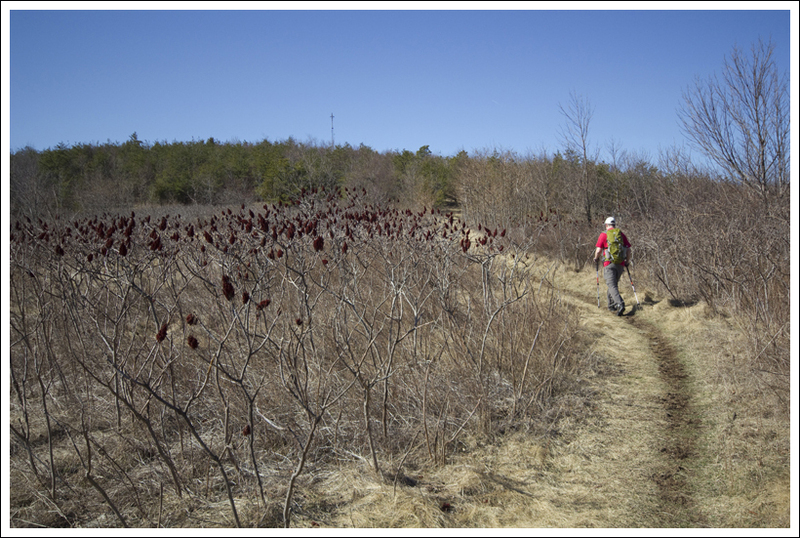 The section of the Appalachian Trail from Beagle Gap to Rockfish Gap gives you nice, open views of the mountains and farmland surrounding the city of Waynesboro. Adam makes his way along the Appalachian Trail up to the top of Bear’s Den Mountain. 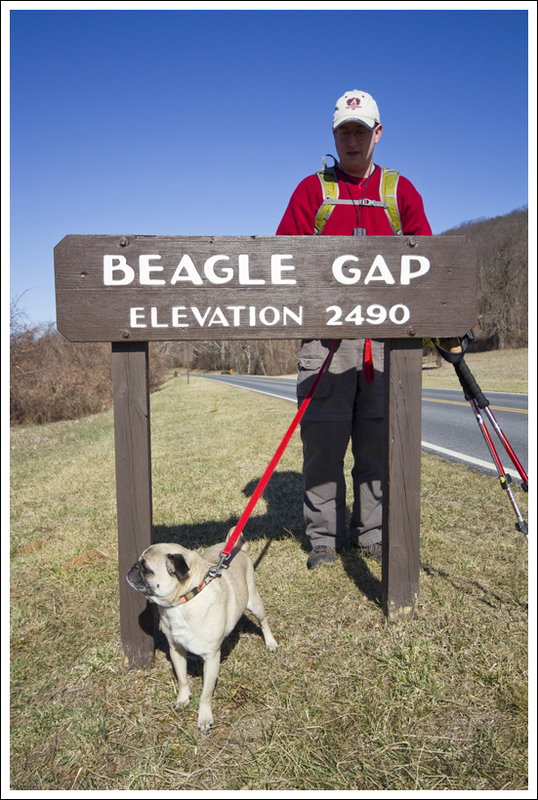 Below: Adam and Wookie pose at the Beagle Gap sign; This white blaze looked like it was painted on a headstone; Adam passes some giant rocks along the trail. Those that have been following our blog may know that we have been working on hiking the Appalachian Trail through Shenandoah National Park in smaller sections. On this day, we decided to handle the stretch between Beagle Gap to Rockfish Gap in the south district. We left one vehicle at the junction of I-64 before the pay station at the park’s south entrance. We then drove into the park and parked at the Beagle Gap parking area (not the Beagle Gap overlook). The Appalachian Trail crosses the road at this gravel parking lot. We crossed the road from the parking lot and headed through the gate. Take a left as soon as you go through the gate and walk through the field . The south-bound AT then climbs rather steeply through some open areas and crosses over a fire road early on the trail. At .5 miles, you reach a communication tower and some old tractor seats. 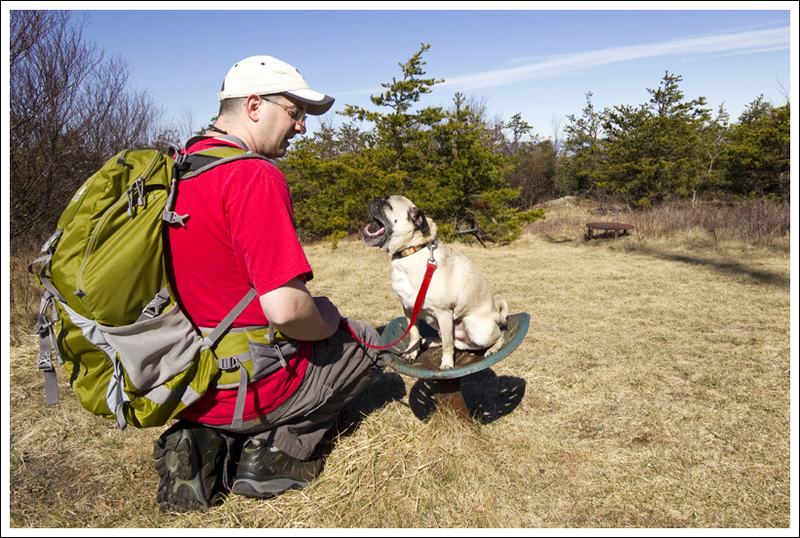 I’m sure that many AT thru-hikers have enjoyed taking a brief rest on these seats. At one point, I’m sure these seats provided a nice place to view the western sunset, but now the trees in front have blocked some of the scenery from view. Continue past this area and keep following the white blazes to stay on the trail. At the one-mile marker, you will come to another communication tower. Stay on the white-blazed AT and the trail begins to descend. 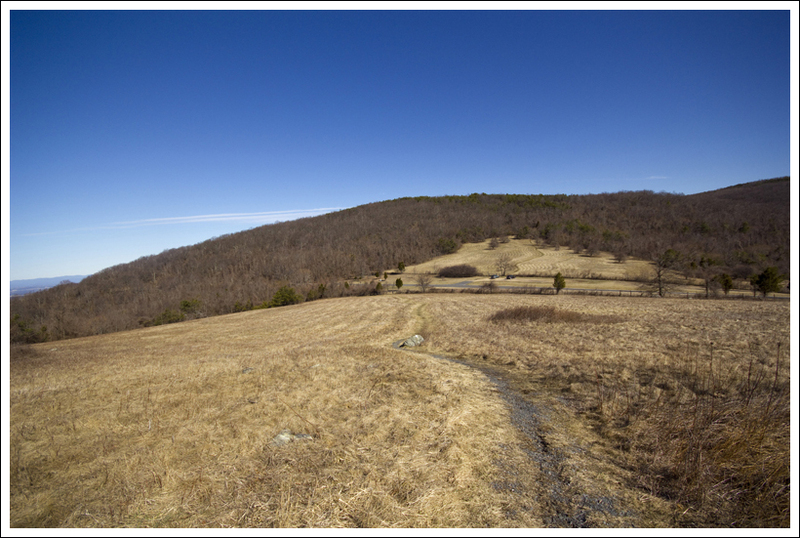 At 2.0 miles, the trail reaches McCormick Gap and crosses Skyline Drive. Cross the road and you will come to a small ladder stile that will lead you on to private land. 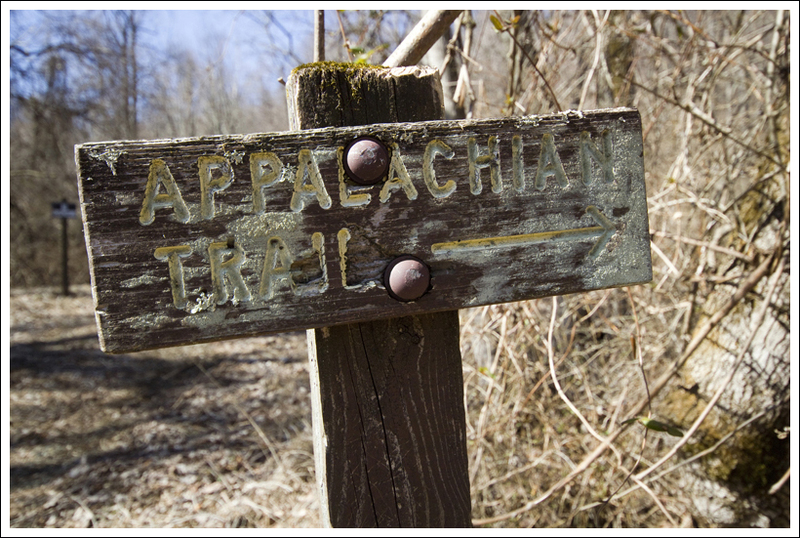 This part of the trail is on private land, but hiking on the AT is allowed. 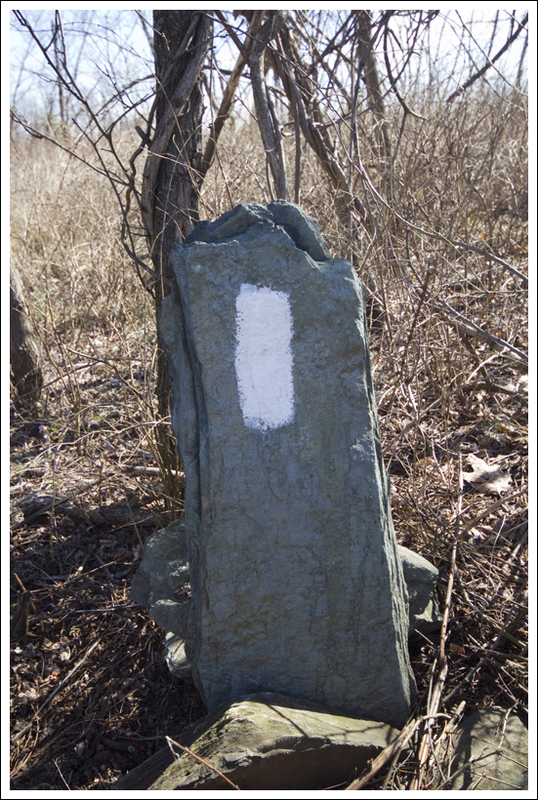 As soon as you cross over the stile, you will see a weathered sign pointing the way to continue on the Appalachian Trail. This section of the AT is very steep as it winds up Scott Mountain. 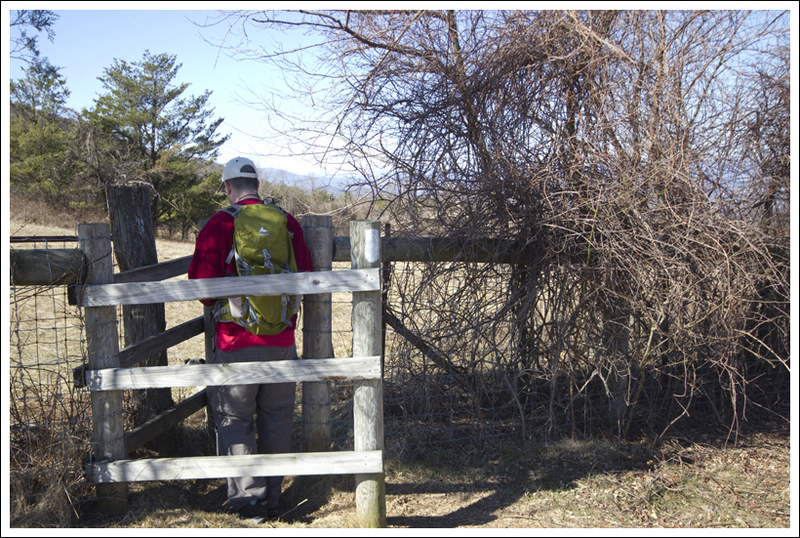 At 2.4 miles, the trail levels off and you will begin to enjoy some obstructed views (probably very limited during the spring and summer months) of Waynesboro and the farmlands around the city. At 3.0 miles, you will begin several miles of very gradual descent (with some uphills thrown in) until you come out onto Skyline Drive. Continue to follow the road for a brief walk back to your car, crossing a bridge over I-64 before reaching your vehicle. 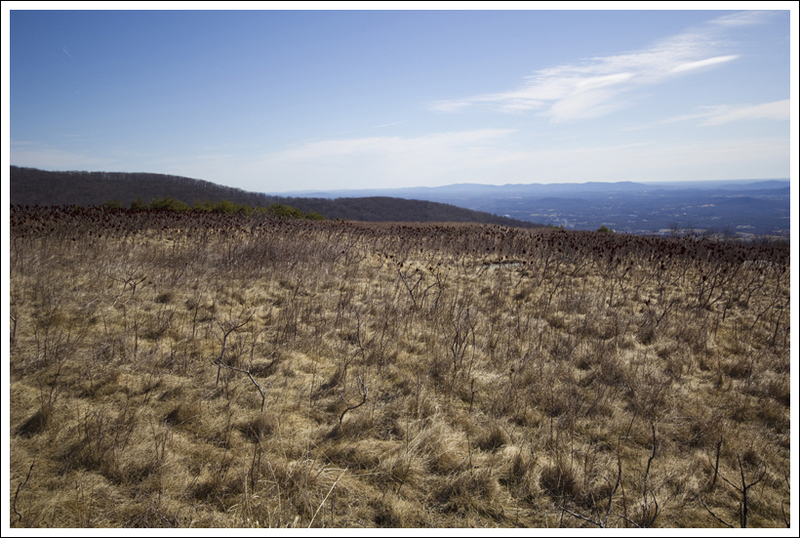 This is one of the few open, meadow-like sections of the Appalachian Trail in Shenandoah National Park. Below: This section of the trail uses an easement on private land; Some colorful dried plants on the mountainside; An open and barren view from Bear’s Den Mountain. The hike from Beagle Gap to Rockfish Gap was an interesting section of the AT. The way up to the communication towers included some of the more open areas of the park. Most hikes in Shenandoah National Park involve hiking through the woods, but this first two-mile section gives you nice views around. When we got to the communication tower, it was interesting to think of what would have been here before these towers existed. I can just imagine people in the 1950s hiking up from the road to view the sunset and perhaps having a picnic at the top. You can also read an interesting history on the area on PATC’s website here which explains the use of Rockfish Gap during the Revolutionary War. I’m glad we did this hike before Spring hit, since many of the views through the woods would have been obstructed with leaves on the trees. Well, winter is over and we didn’t meet our goal of finishing the entire AT through Shenandoah. In fact, we’re still less than a quarter of the way there. The road through the park was closed so often this winter, that it was really tough for us to get to the sections we needed to hike. 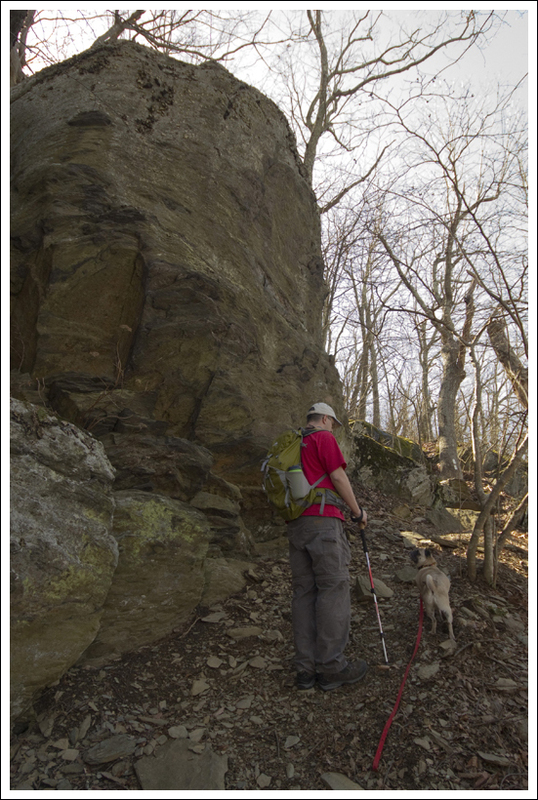 The section we hiked most recently, Beagle Gap to Rockfish Gap was a shorter segment than we usually like to hike. Adam’s knee was bothering him, we wanted to take Wookie and we had a limited amount of time, so the 5.7 mile segment ended up being perfect for the day. 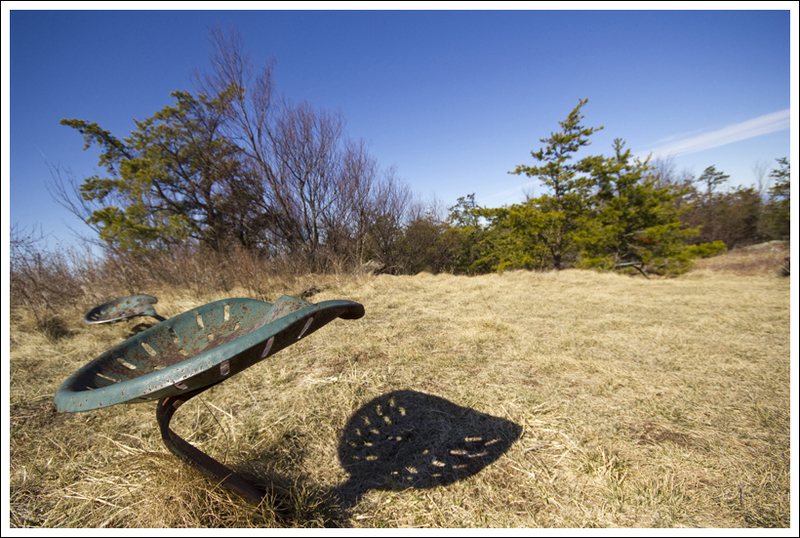 Old tractor seats are planted in the ground next to the radio towers on Bear’s Den Mountain. Below: The radio towers; Wookie enjoys relaxing on a tractor seat. The day was so pretty and warm! The skies were crystal clear and blue, but there weren’t really any signs of spring in the mountains yet. I led Wookie on his leash – which was a little bit tricky to do with my trekking poles. He kept yanking them slightly forward or to the side, especially on uphills and downhills. Wookie is actually really well-mannered on a leash – but he likes to walk up and down hill much faster than I do! I envy his energy. We took a short break atop Bear’s Den Mountain to enjoy the open views. The radio towers are a distraction from the natural beauty of the area, but I suppose they’re necessary. Upon leaving the summit, the trail was actually a little bit confusing. There were some unmarked side trails that crossed the path. The fire road that runs alongside the trail was also somewhat misleading. Luckily, the AT through Shenandoah is generously marked with white blazes and even when we took the wrong path, we were quickly able to notice the lack of blazes and set ourselves right. Adam climbs the stile heading south out of McCormick Gap. 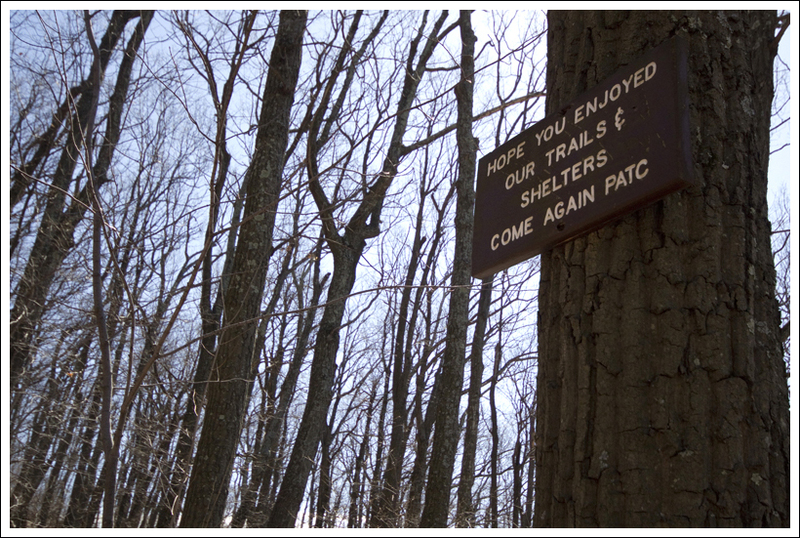 Below: A beat up old AT sign; Wookie and Adam share some trail mix; The PATC does a great job maintaining trails and shelters along the AT in Shenandoah. I noticed that this section of Appalachian Trail was a bit more up and down than typical for the park. The climb down and up through McCormick Gap is actually quite steep – especially the southbound climb up leaving Skyline Drive. That was really the only tough section of this hike. Once we were out of McCormick Gap, the remainder of the hike was a gentle series of rolling ups and downs (mostly). We passed a lot of giant boulders, had a snack, crossed a shallow stream, and enjoyed the views looking down into Waynesboro. We passed a couple other hikers headed north and saw one southbound backpacker. Soon, Skyline Drive and the distant interstate came into view and we were back at the car. When I heard Christine and Adam talking about hiking from Beagle Gap, I knew I had to come along. I was assuming that this was an area that beagles gathered, so I thought it would be great. But alas, there were no beagles around. We hiked up to the communication towers and I got to sit on the old tractor seats. I was a little skeptical at first, but I found a good seat to enjoy the views and relax a little. I had two big highlights on the hike. The first was meeting Winnie. Winnie was another pug that I met on the trail. Her master was a PATC member that actually maintains this section of the trail. It was impressive to learn that Winnie’s master also backpacked the entire Shenandoah National Park over ten days for her 70th birthday! 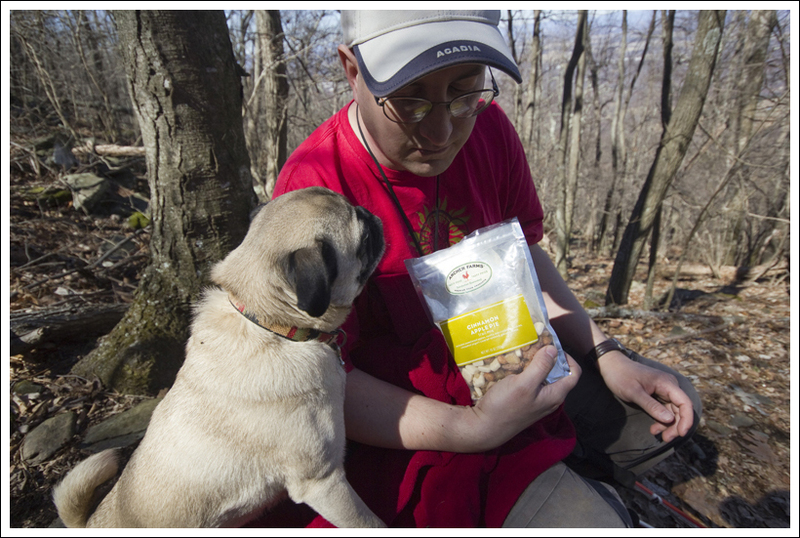 I’m always a little nervous meeting new dogs on the trail, but it’s nice to see some other hiking pugs out there. My second highlight had to be the snack that I had. Adam gave me a few bites of Cinnamon Apple Pie trail mix which included some dehydrated apple bits, cinammon-covered yogurt, and pecans. It was a great boost to give me some energy to finish the hike. Overall, the trail wasn’t too tough for me. There are a few steep sections in the beginning and from McCormick Gap up to Scott Mountain, but by the end I was proudly leading the way. Difficulty –2.5. There are a few uphill steep sections heading southbound, but the longest stretch of them is .3 miles. Trail Conditions –4. The trail is well-maintained and the footing was great. Views – 3.5. 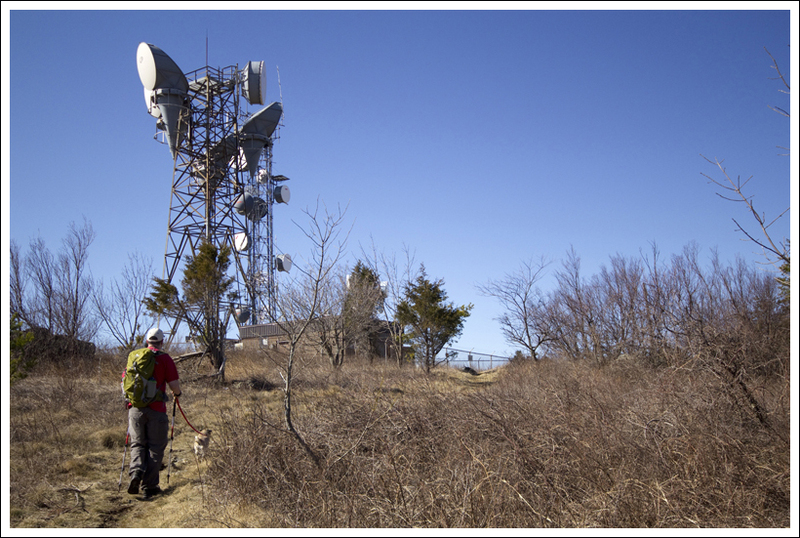 The best views are during the beginning of the trail before you reach the communication towers. There are obstructed views towards the second half of the trail. Wildlife – 1. Other than birds, we didn’t see much wildlife here. Ease to Navigate –3. The only tricky section was around the communication towers. You just want to be sure you follow the white-blazed trail. I believe the other trails from the communication towers will still bring you the same way, but I would stick to the white blazes. Solitude– 3. We only ran into a few people on this trail. During the summer, the hike from Beagle Gap to the summit of Bear’s Den Mountain is quite popular, though. Directions to trailhead: On Skyline Drive, park at mile 99.5 at the Beagle Gap gravel parking lot on the eastern side of the road. The trail begins across the road on the western side and through the gate. I believe I read the tractor seats were to view fireworks, so even though trees may obstruct a hiker’s view, the fireworks could be seen higher in the sky by those seated there. Neat! I’ve never heard that before. That’s a good question. I’ll be starting at Buena Vista and finishing at Front Royal, so my best guess is 10 or 11 days. 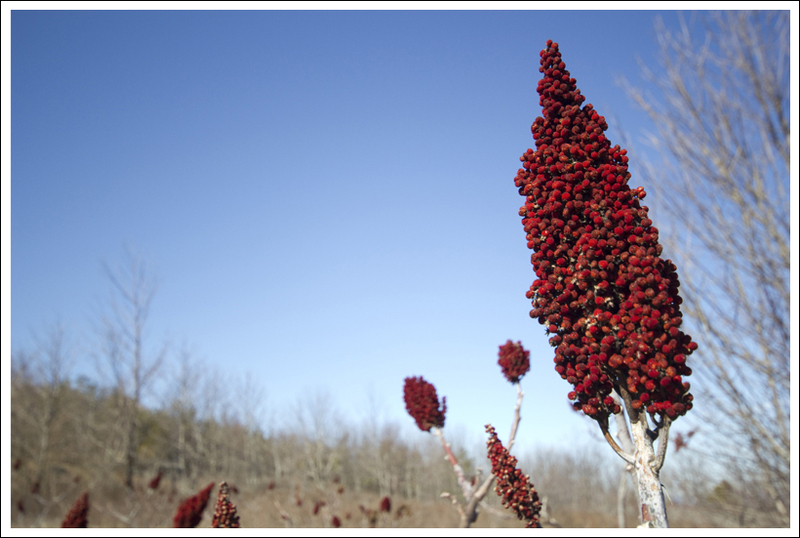 Looking forward to enjoying a couple blackberry milkshakes while hiking through SNP! That sounds like a great stretch of trail! Loving the hike so far, but the climb up Three Ridges was tough! 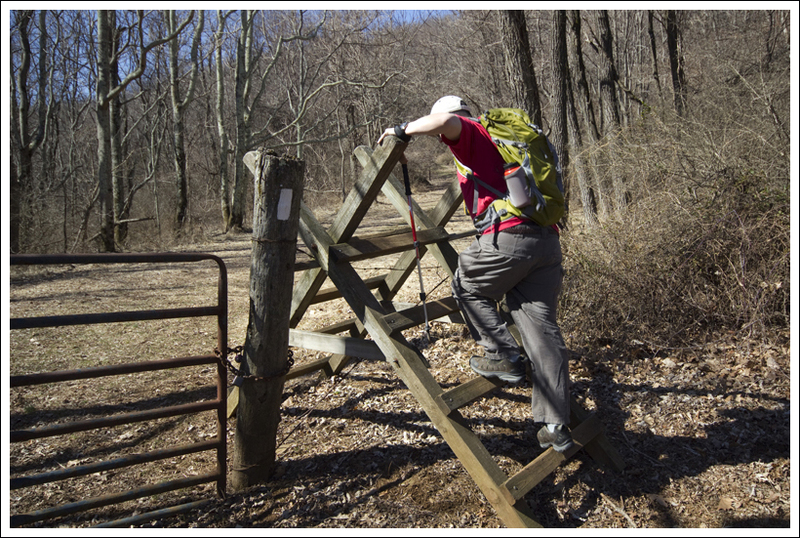 Three Ridges (especially the ascent of the Mau-Har trail) is one of the toughest climbs in Virginia! I’m glad you’re having such a good trip so far. We’re glad you’ve found the AT breakdown helpful, Wade! How many days are you spreading your hike across? I’m getting ready to hike the AT through SNP later this month and discovered your site while looking for trail info. I had a great time reading each of your entries about the AT, what a great resource! Thanks so much for taking the time to write these fun and informative guides, they’ve been a big help!